> Growing up in Malaysia, Indian food was a regular staple for me, but little did I know that what I ate as a child was south Indian food and there was a host of Indian regional food that I was unfamiliar with, until that is, I was a teenager and had a good friend from Gujurati. Later on, I met other Indians while working in Hong Kong who were from northern India and hence began my foray into the vastness of what Indian cuisine had to offer. On a recent visit to an Indian feast hosted by Royal Khyber restaurant in Santa Ana, my blogger friends and I, along with my 10 year old son, were presented with a meal like no other I’d ever had in a restaurant before. This was the type of food I had only experienced in the homes of my Indian friends, food that was lovingly prepared using the best ingredients and not in the least bit greasy and heavy like that I’d found while dining at Indian restaurants in America. We began our meal with a series of appetizers including smoked lamb cakes, spicy calamari, paneer couscous cakes (pictured left) and olive naan. I always know when something tastes exceptional because my son, who has a very adult palate, will ask for a second helping — which he did with all the appetizers. 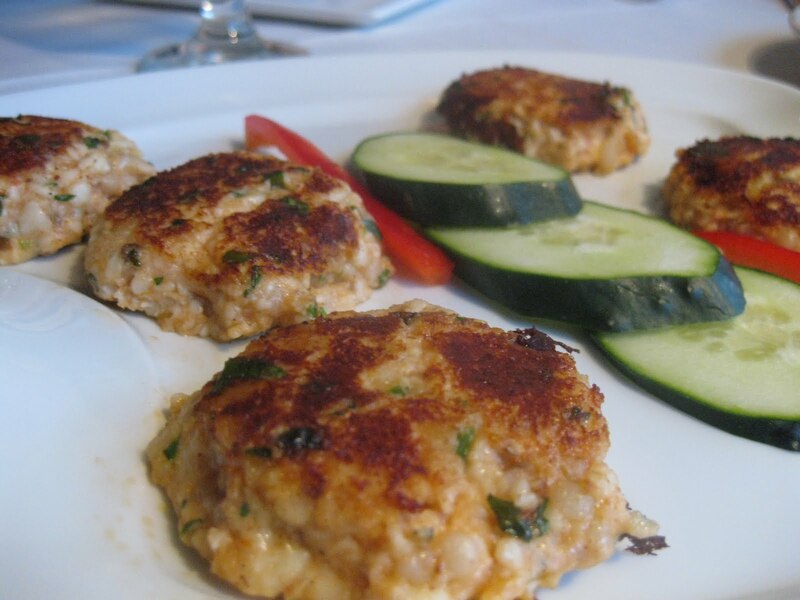 Lamb cakes were well seasoned patties of ground lamb served with a tamarind, ginger, basil honey sauce — these were wonderful because you can really taste the gameyness of the lamb, but it didn’t overpower the whole dish due to the blend of spices used to season them. 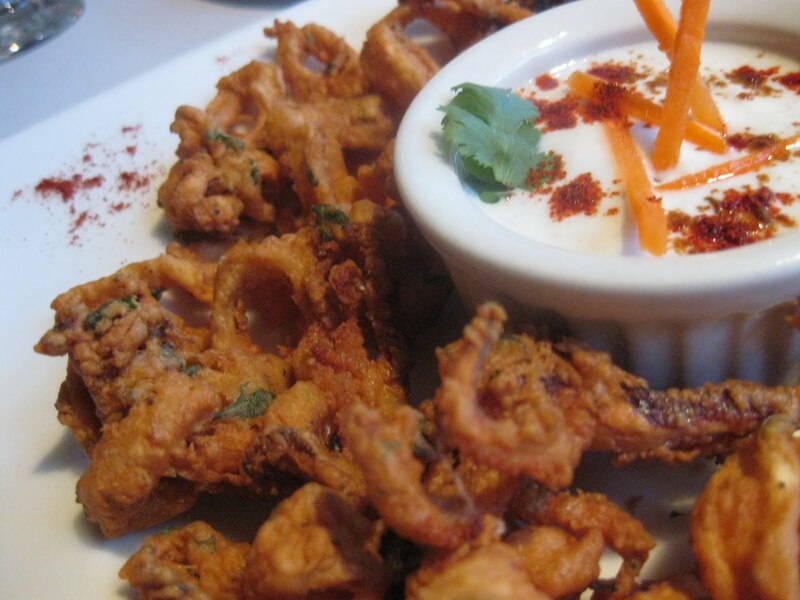 Spicy calamari (pictured right) at Royal Khyber is an Indian take on calamari fritto in that the calamari is dipped into a chickpea batter and fried, similar to the vegetable pakoras, giving it an exotic and luxurious element than its Italian counterpart. Paneer couscous cakes tasted neither like couscous nor paneer, (an Indian “cheese”, but more like a solid milk cube and does not utilize rennet in its solidifying process) but rather a very healthy rissole. Serrano chiles give them a nice little kick. Dal (lentil) soup (pictured left) was absolutely fantastic! I’ve always been a fan of dal and to have it in a soup that is completely vegetarian and tasted so rich and complex was incredible. This is something I would definitely order again! Curried seafood (pictured right) wasn’t very strong, in fact, the broth was so subtle it never overpowered the seafood in any way. 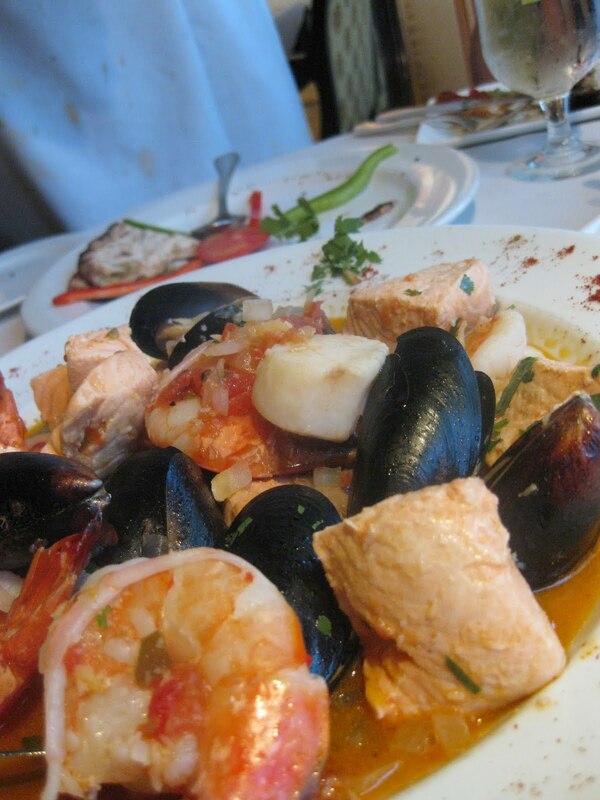 Like a bouillabaise or cioppino , this beautifully presented stew if you will, consisted of shrimp, salmon, mussels, calamari, scallops and lobster tail swimming in a light broth of Chardonnay, dessicated coconut and a touch of Karahi sauce — traditionally containing onions, garlic, ginger, and tomatoes. And if you thought Indian food wasn’t healthy before, you’ll change your mind when you hear that olive oil is used in this dish. This is Arun Puri’s — owner and innovator of this creative menu — vision, to bringing healthier Indian cuisine to southern California. Our entrees soon arrived and the spread seemed never-ending. 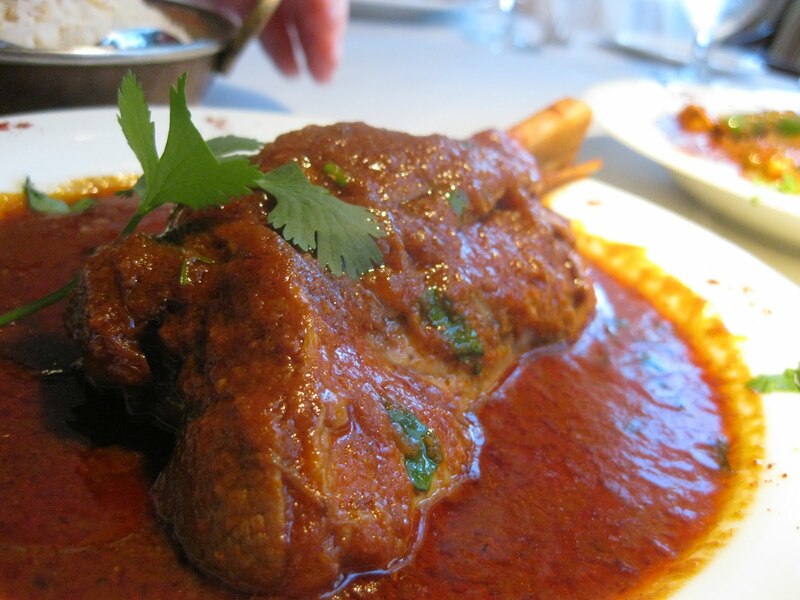 One of the house specialties is the Kyber nectar (pictured left) a slow braised lamb shank which combines a stash of secret spices — and no, they won’t tell you what they are — and the intricacies of this dish includes a 14+ hour slow cook to achieve the lamb shank’s fall-off-the-bone texture. The sauce is richly decadent and you will fall in love with it at first bite! The use of brown mustard seeds and Sarson Ka Tel (mustard oil) is prevalent in Bengali cooking and it is no wonder that the Bengali mustard fish (pictured right) consists of both these elements. Catfish, usually not one of my favorites due to its muddy after taste was perfect in this dish as the strong sauce, which included turmeric and red chiles, would have overshadowed a milder fish. This was one of my favorites. Kashmiri Dum Aloo is a potato dish generally cooked with ‘pressure’ — dum means pressure in Hindi and aloo is potato — is a Kashmiri delicacy and the dum method of cooking is said to have been brought by the Mughals from Central Asia. 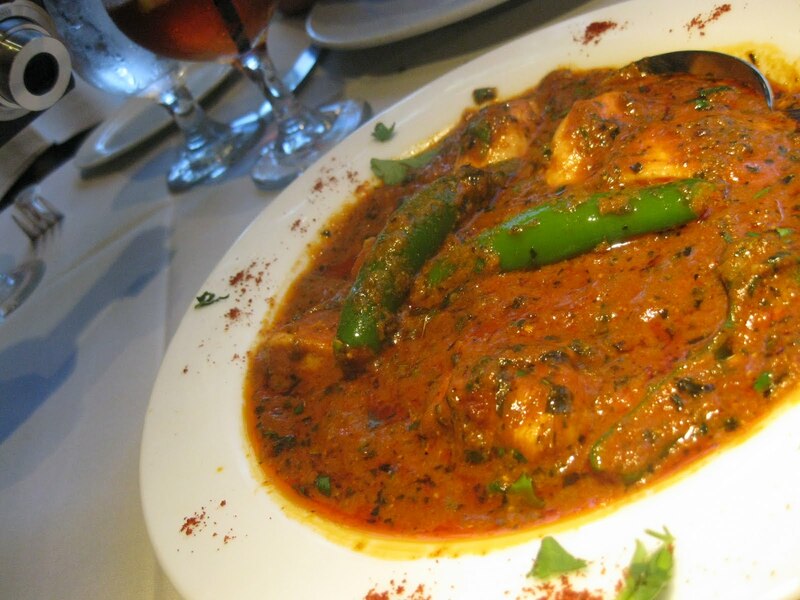 At Royal Khyber, the dum aloo is given a crowning glory by topping them with silver paper. Methi Punjabi chicken (pictured left) is a mild curry-like dish prepared using fenugreek (methi), but here, it is spiced up some with Serrano chiles, perfect for my obsession with spicy foods! For those who aren’t as savvy with the heat as I am, you can omit the chiles and still enjoy the chicken immensely. I’m not a big fan of sweets due to my diabetes, but Mr Puri sold me on how he’s been experimenting on lowering the sugar content of his Indian desserts to suit customers just like me who have to watch their sugar intake, but still, wish to enjoy traditional Indian sweets after their meal. I’ve never liked Indian desserts purely because they’ve always been way too sweet for my palate, but I was open to sample these new-age desserts. Gulab jamun has always been something I’ve shunned from because to me, they’d always been balls of dough soaked in a sweet syrup and nothing else. I was surprised that these gulab jamun weren’t sickly sweet, nor were they super heavy in texture. These were gulab jamun I could eat on occasion. 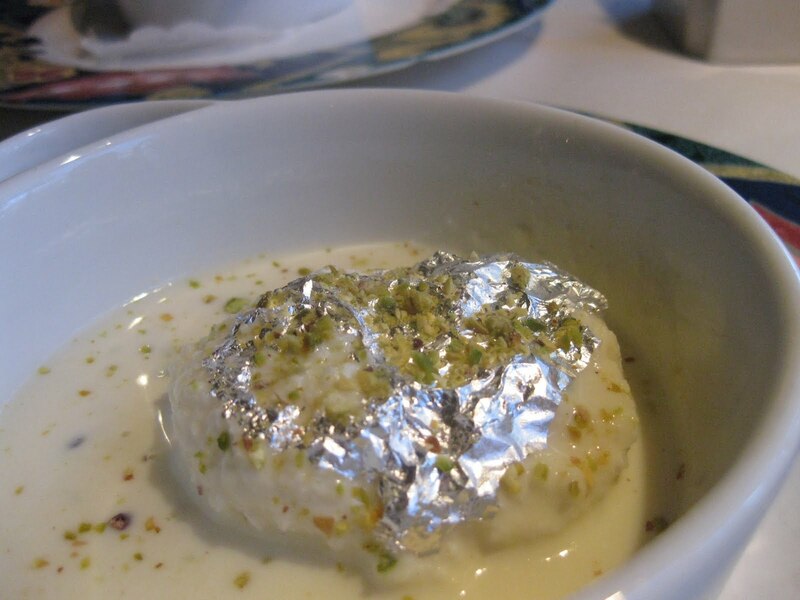 There was also a rice pudding as well as rasmalai (pictured right) a dessert using ricotta or cottage cheese as its basis — I believe paneer is used here — and soaked in sweetened condensed milk. I tried them, but honestly, I could just take it or leave it. The meal on its own was more than enough to satisfy this gluttonous blogger and the best part was, I didn’t slip into a food coma like I usually do after an Indian meal! >I was lucky enough to eat at Royal Khyber twice when my boss booked Christmas parties there for us two years in a row. I didn't try half of what you did though. What a fascinating and beautifully written review!! >Thanks! It was an amazing meal. They had the Groupon yesterday and I bought one so I could go back again.